Qualcomm at its Innovation Qualcomm event has confirmed plans to launch 2.5GHz quad-core SoCs in 2012. The company will be using its next-gen Krait architecture for these chips that boast almost double the speed of what’s currently available on the market. 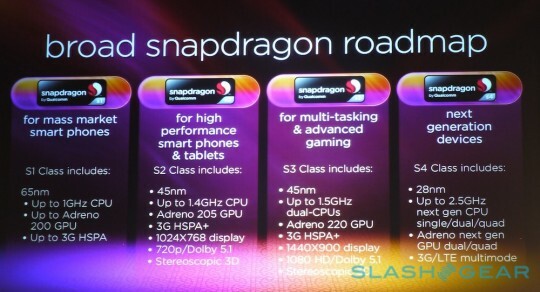 The new S4 class chipset will be built on a 28nm process and will come with Adreno Graphics, 3D capability, full 1080p HD, as well as 3G and LTE connectivity as standard features and will be available in single-core, dual-core, and quad-core versions with speeds up to 2.5GHz. The S4 class will be the high-end line. But Qualcomm will also be offering less powerful chips of the S1, S2, and S3 classes for budget and mass market devices. According to the company the chips will be available to manufacturers by year-end and can be expected to ship in consumer devices at the start of 2012. So this means that we can expect to see the first 2.5GHz handsets launching at Mobile World Congress in February of next year.